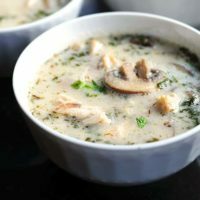 This Coconut Chicken Soup Recipe is one of our favorites, and it’s quick and easy enough to make any night of the week. There’s a fantastic sushi /hibachi/thai restaurant just outside of Brevard, NC that we enjoy from time to time. It’s a great little spot for lunch or dinner. 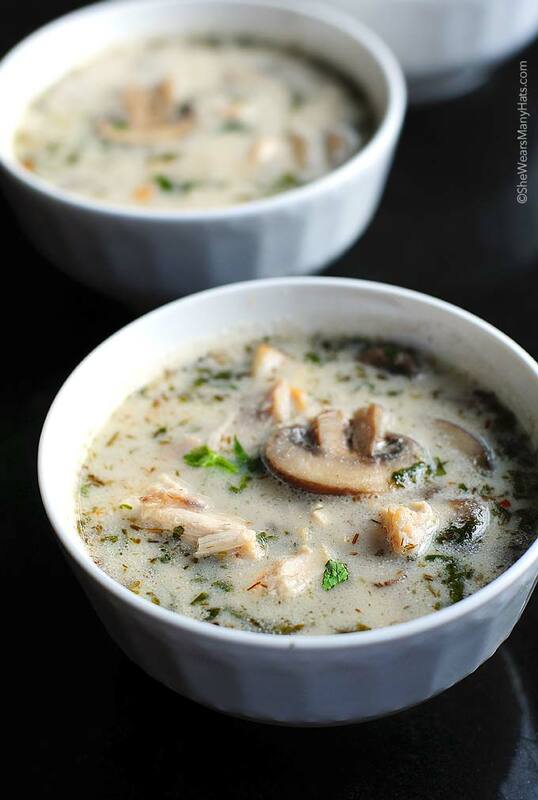 Often we order a bowl of coconut soup with shrimp, which reminds me of my version of Coconut Chicken Soup (sometimes known as Tom Kha Gai). I really do like making soups and chilis any time of the year and this one is a real winner. 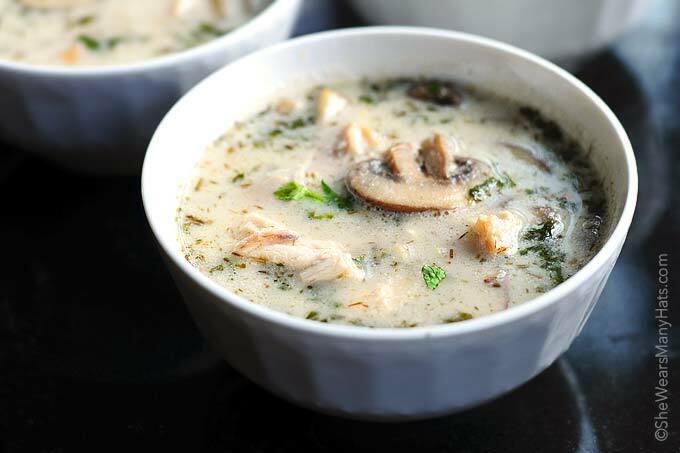 If you’ve never had it before, Coconut Chicken Soup is a flavorful soup made with a chicken stock and coconut milk base, along with ginger, lemon grass, a bit of pepper, sometimes mushrooms, and a smidge of fish sauce. Just a smidge. It’s what makes the flavors pop. Really. It’s the umami thing going on. Don’t skip the fish sauce. Don’t diss the fish sauce. 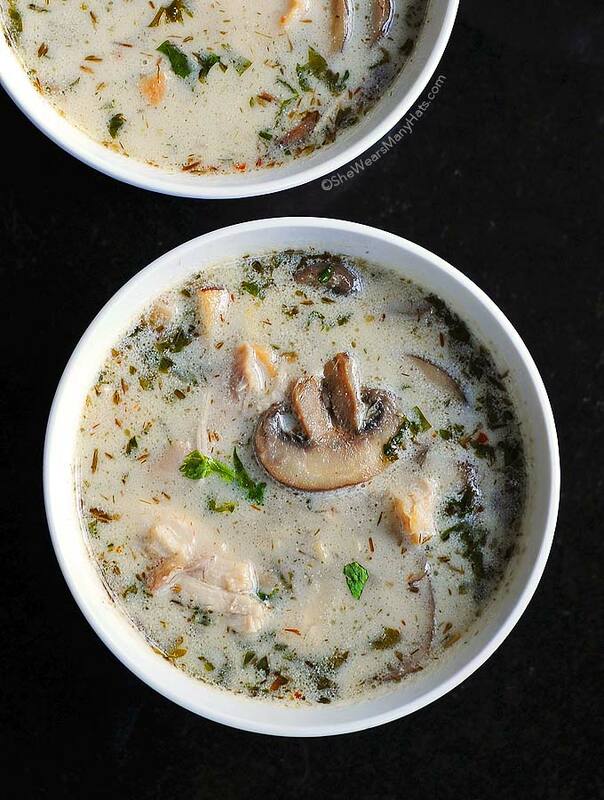 If you’re in a hurry, this easy Coconut Chicken Soup can be cooked in about 30 minutes. If you have longer, let it linger on low. Soups like to linger. Lingering is a good thing. Fresh ginger is readily available in most grocery stores and relatively inexpensive too. Fresh ginger is so very different from the dried ground version, but if fresh is not an option, substitute 2 teaspoons of dried ginger, then adjust to taste before serving. If using fresh ginger, an Asian Spider will work wonders to retrieve it. Fresh lemongrass on the other hand can sometimes be hard to find. You can grow your own, hunt it down locally or online, or use a dried version for this recipe. I keep dried lemongrass on hand for this soup as well as for hot tea. It’s lovely. Fresh is best, but dried will do just fine. Again, this recipe calls for fish sauce. Yes, it’s strong but no one will ever know it’s in there unless you tell them. It really adds to the fullness of flavor. Remember to refrigerate after opening and you’ll be prepared for your next batch of coconut milk soup. A Thai-inspired soup with wonderful flavor. It's quick and easy to make too. Heat oil in large saucepan over medium heat. Add ginger and lemon grass, stir to toast until fragrant, about 2 minutes. Add mushrooms and stir for another 2 minutes. Add chicken stock, lime juice and pepper flakes; bring to a simmer and simmer for 8-10 minutes. If large pieces of ginger are going to bother you, hunt them down and remove (an Asian spider will help do the job, of course a slotted spoon works too). Garnish as desired with chili oil, cilantro leaves and/or lime wedges. *Fresh ginger is relatively inexpensive and so very different from dried, but if fresh is not an option, substitute 2 teaspoons of dried ginger, then adjust to taste before serving. **This recipe calls for very little fish sauce. Yes, it’s strong but no one will ever know it’s in there unless you tell them. It really adds to the fullness of flavor. Remember to refrigerate after opening and you’ll be prepared for your next batch of coconut milk soup. OR soy sauce may be substituted. Originally posted October 30, 2014. I think we need to make another batch real soon for a ladies lunch bunch. What cha think? This was AWESOME for a sick with colds family! Thanks for sharing! Glad y’all enjoyed it, Kimberly! I made this last Friday in a slow cooker . As I was in a rush I decided to try it. Instead of using rotissery chicken meat I put 10 chicken leg piece (drumetts and thighs)s, skinned in and used 1 tsp sambal oleek instead of the chili peppers. I also added one chopped tomato and the zest of the like along with the juice. I put half the cilantro in the slow cooker and used the rest when I served it with bowls of rice on the side..i cooked it on high for four and a half hours and the result was amazing! I’m actually making this again today as I’ll be out of the house all day. Thanks so much for the inspiration. That sounds fabulous! Totally trying it in the slow cooker next time. Thank you for sharing! I forgot to mention- I only used one teaspoon of fish sauce! Ok…so my slow cooker must be cooler than most..as two friends said that on the high setting the coconut milk curdled (I’m sure they really hate me now) One friend did it on slow for 6 hrs and hers was fine as was mine when I did it on the low setting. Not sure what to advise here for everyone now but for sure don’t do it on your high setting. Thanks for sharing Lynda! I have yet to try it in a slow cooker. 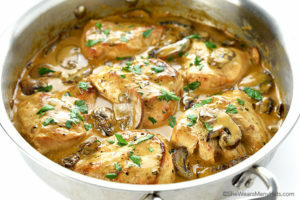 I’m making this today, sounds amazing! Can you freeze leftovers?? Hmmm … we’ve never had any leftover to try freezing it, although I think it should work okay. Do you use regular or light coconut milk? If I used light, would that have a significant disadvantage to the flavor? Hello, Jessica! I’ve used both and it is fine. Personally, I don’t really taste that much of a difference. I used my slow cooker also. But I sautéed the veggies first then added the broth and then dumped it into the slow cooker. I also added wild rice. I was also going to add book Choy but I was so hungry after yoga that I forgot, lol. But it was delicious! Does the coconut milk need to be chilled for this? Or is room temp fine? The coconut milk is from a can and at room temp. I added another can of coconut milk as it was too watery with just one. Very tasty. Currently, I do not have nutritional information for this recipe. I love this soup & want to introduce my BF to it but he has a severe fish allergy. Any suggestions on a possible substitute for the fish sauce? Could soy sauce work? Yes, soy sauce would be a good substitute or leave it out altogether and don’t worry about a substitution.